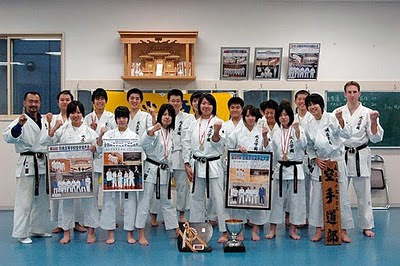 Karate club graduation memorial album photo. Since the school year in Japan runs from April to March, soon this year will only become a memory. The third year students have graduated now. As part of the Karate club they participated in several regional and one national high school championships. Whereas in Canada the school year runs from September to June, I like this April start. The days are getting warmer, the flowers are coming out and it feels like the world is renewed. A good time to start the next stage. Good luck to the recent graduates. And good luck to the new students entering the school!